Eighteen months ago, Firebase joined Google. Since then, our backend-as-a-service (BaaS) that handles the heavy lifting of building an app has grown from a passionate community of 110,000 developers to over 450,000. Our current features -- Realtime Database, User Authentication, and Hosting -- make app development easier, but there’s more we can do, so today, we’re announcing a major expansion! Developer experience matters. Ease-of-use, good documentation, and intuitive APIs make developers happy. Work across platforms. We’ll support you whether you’re building for iOS, Web, or Android. Integrate where possible. Firebase has one SDK, one console, and one place to go for documentation and support. You can mix-and-match any of our features and, where it makes sense, data flows between them to help you do more, faster. 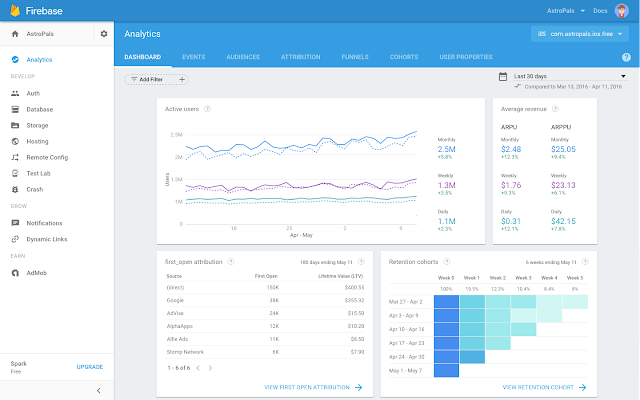 First, Firebase Analytics is user and event-centric. Instead of focusing on pageviews, screenviews, and sessions, it gives you insight into what your users are doing in your app. You can also see how your paid advertising campaigns are performing with cross-network attribution, which tells you where your users are coming from. You can see all of this from a single dashboard. 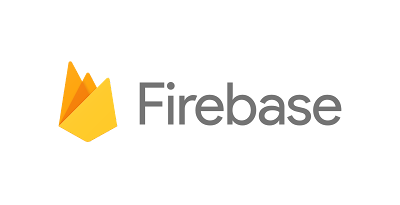 Second, Firebase Analytics is integrated with other Firebase offerings to provide a single source of truth for in-app activity and through a feature called Audiences. Audiences let you define groups of users with common attributes. Once defined, these groups can be accessed from other Firebase features -- to illustrate, we’ll reference Audiences throughout this post. To help you build better apps, our suite of backend services is expanding. Google Cloud Messaging, the most popular cloud-to-device push messaging service in the world, is integrating with Firebase and changing its name to Firebase Cloud Messaging (FCM). Available for free and for unlimited usage, FCM supports messaging on iOS, Android, and the Web, and is heavily optimized for reliability and battery-efficiency. It’s built for scale and already sends 170 billion messages per day to two billion devices. One of our most requested features is the ability to store images, videos, and other large files. We’re launching Firebase Storage so developers can easily and securely upload and download such files. Firebase Storage is powered by Google Cloud Storage, giving it massive scalability and allowing stored files to be easily accessed by Google Cloud projects. The Firebase Storage client SDKs have advanced logic to gracefully handle poor network conditions. Firebase Remote Config gives you instantly-updatable variables that you can use to tune and customize your app on the fly to deliver the best experience to your users. You can enable or disable features or change the look and feel without having to publish a new version. You can also target configurations to specific Firebase Analytics Audiences so that each of your users has an experience that’s tailored for them. In addition, we’re continuing to invest heavily in our existing backend products, Firebase Realtime Database, Firebase Hosting, and Firebase Authentication. Authentication has seen the biggest updates, with brand new SDKs, and an upgraded backend infrastructure. This provides added security, reliability, and scale using the same technologies that power Google’s own accounts. We’ve also added new Authentication features including email verification and account linking. For Hosting, custom domain support is now free for all developers, and the Database has a completely rebuilt UI. We’re working hard on other great Realtime Database features, stay tuned for those. We’re adding two new offerings to Firebase to help you deliver higher quality apps. When your app crashes, it’s bad for your users and it hurts your business. Firebase Crash Reporting gives you prioritized, actionable reports to help you diagnose and fix problems in your iOS or Android app after it has shipped. We’ve also connected Crash Reporting to Audiences in Firebase Analytics, so you can tell if users on a particular device, in a specific geography, or in any other custom segment are experiencing elevated crash rates. Cloud Test Lab, announced last year at Google I/O, is now Firebase Test Lab for Android. Test Lab helps you find problems in your app before your users do. It allows for both automatic and customized testing of your app on real devices hosted in Google data centers. After you’ve launched your app, we can help you grow and re-engage users with five powerful growth features. Firebase Notifications is a new UI built on top of the Firebase Cloud Messaging APIs that lets you easily deliver notifications to your users without writing a line of code. Using the Notifications console you can re-engage users, run marketing campaigns, and target messages to Audiences in Firebase Analytics. Firebase Dynamic Links make URLs more powerful in two ways. First, they provide “durability” -- links persist across the app install process so users are taken to the right place when they first open your app. This “warm welcome” increases engagement and retention. Second, they allow for dynamically changing the destination of a link based on run-time conditions, such as the type of browser or device. Use them in web, email, social media, and physical promotions to gain insight into your growth channels. Firebase Invites turns your customers into advocates. Your users can easily share referral codes or their favorite content via SMS or email to their network, so you can increase your app's reach and retention. Firebase App Indexing, formerly Google App Indexing, brings new and existing users to your app from the billions of Google searches. If your app is already installed, users can launch it directly from the search results. New users are presented with a link to install your app. AdWords, Google’s advertising platform for user acquisition and engagement, is now integrated with Firebase. Firebase can track your AdWords app installs and report lifetime value to the Firebase Analytics dashboard. Firebase Audiences can be used in AdWords to re-engage specific groups of users. In-app events can be defined as conversions in AdWords, to automatically optimize your ads, including universal app campaigns. To help you generate revenue from your app and build a sustainable business, we’ve integrated Firebase with AdMob, an advertising platform used by more than 1 million apps. We’ve made it easier to get started with AdMob when you integrate the Firebase SDK into your app. Using AdMob, you can choose from the latest ad formats, including native ads, which help provide a great user experience. Along with new feature launches, we’re moving our website and documentation to a new home: firebase.google.com. We’re also launching a brand new console to manage your app. It is completely redesigned and rebuilt for improved ease of use, and we’ve deeply integrated it with other Google offerings, like Google Cloud and Google Play. Firebase now uses the same underlying account system as Google Cloud Platform, which means you can use Cloud products with your Firebase app. For example, a feature of Firebase Analytics is the ability to export your raw analytics data to BigQuery for advanced querying. We’ll continue to weave together Cloud and Firebase, giving you the functionality of a full public cloud as you grow. You can also link your Firebase account to Google Play from our new console. This allows data, like in-app purchases, to flow to Firebase Analytics, and ANRs (application not responding) to flow to Firebase Crash Reporting, giving you one place to check the status of your app. Finally, we’re announcing the beta launch of a new C++ SDK. You can find the documentation and getting started guides here. We’re excited to announce that most of these new products, including Analytics, Crash Reporting, Remote Config, and Dynamic Links, are free for unlimited usage. Many things are changing, but Firebase’s core principles remain the same. We care deeply about providing a great developer experience through easy-to-use APIs, intuitive interfaces, comprehensive documentation, and tight integrations. We’re committed to cross-platform development for iOS, Android, and the Web, and when you run into trouble, we’ll provide support to help you succeed. If you were using a Firebase feature before today -- like the Realtime Database, GCM, or App Indexing -- there’s no impact on your app. We’ll continue to support you, though we recommend upgrading to the latest SDK to access our new features. All the new features are ready-to-go, and already in use by apps like Shazam, SkyScanner, PicCollage, and more. Get started today by signing up, visiting our new site, or reading the documentation to learn more.